A successful print! 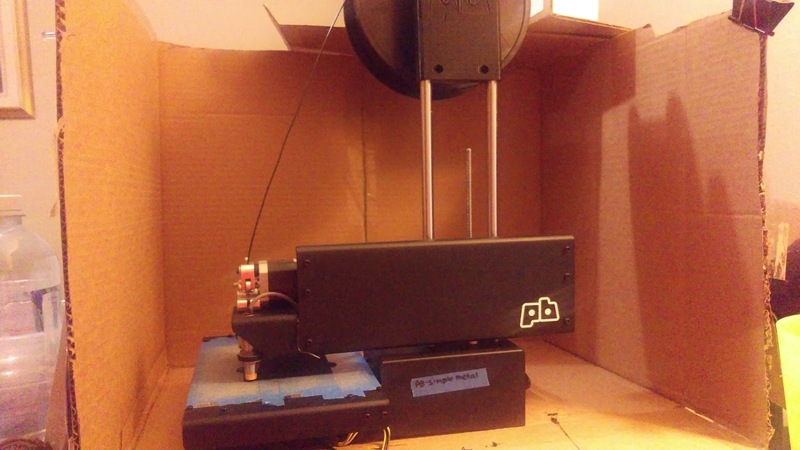 this is a spool holder (Printrbot Simple Metal Spool Holder designed by in_the_garage on thingiverse) it has the printrbot logo printed in it, and it fits perfectly on top of my simple metal Printrbot. This is a vast upgrade from the two tin cans I had my spool resting on before. Images later. Why is a spool necessary, you might ask? Well, if I take my roll of filament and place it on it's side, yes the printer will still pull it.. sometimes. However, it will get "tangled" usually just super tense and kinked up. This isn't great as it will affect the flow and can cause failed prints. I have found that if my printer has too much resistance from the feed it will just stop. if it keeps going with affected flow, there is a possibility that it will compromise your print. I tried standing the spool up on its own, but it would fall all over the place and cause the same problems as the above solution. The two tin cans in a box was my "clever" poor people workaround. I had two recycled cookie tins full of pens. i put them in a box so that they would always be lined up and contained, and then put my spool on them. It was a pretty good idea, and decreased my percentage of botched prints. But it didn't eliminate it, and I still ran into issues with weight and balance. Sometimes it would be too heavy, and it would strain a bit, towards the end of the roll it would be very light and the roll would jerk around and flip out of the container. This is both noisy and can have the same effect as just leaving it on its side, as sometimes it would do just that. I knew I needed a good spool holder. I tried a one piece, solid in red ABS, and like all of my ABS I send through this printer, it was cracking and warping before the print was over. It held out for a couple prints, but the jiggling in combination with the weight caused it to snap. 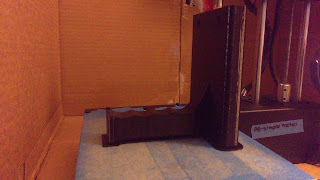 So I decided to print a sturdier, larger spool holder. It is pretty nice, and you can tell there is basically no resistance when it is printing. 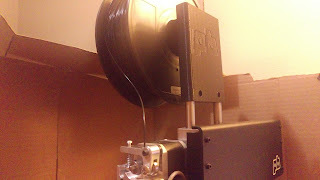 When I get to the end of my current spool I will update on how it handles at the end when the spool is lighter.